Sitcoms of the 80s were good and all, but I mean, Seinfeld and Saved By the Bell didn't really get going until the 90s, so there's always going to be a limit to the nostalgia I feel upon seeing most of these 80s-TV-series-themed gift ideas. I did love me some ALF and Perfect Strangers though. And the fact that we still say things like, "Norm!" and "Cut. It. Out," the latter with accompanying hand gestures, and...what? You don't unleash the classic Uncle Joey line when you sense someone's trying to pull a fast one on you too? Well. Your loss, dude. My gift guide to 80s television isn't exhaustive, but it is a good mix of retro items and memorabilia that have survived the decades, and new items artists have created to pay their respects to the heroes of their childhoods, and the characters that have solidified their spots in the annals of pop culture. Note: Items in the Sitcoms of the 80s Gift Guide are listed as they were at printing. Prices are subject to change. 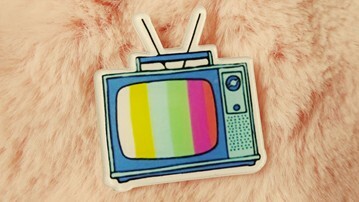 And if you like the 80s TV pin with the SMPTE color bars in the image above, you can get yourself one of those here. Blanche, Dorothy, Rose, and Sophia. They're saints in my book. No mama or grandmama I knew wasn't glued to the TV for the Golden Girls - Empty Nest tag team on Friday nights. It always gave me a good 54 minutes to sneak extra dessert and, as I got older, sneak back and listen to the NWA and tapes my mama took away from me. Now you can spend up to 4,800 minutes thanking the Golden Girls for being a friend with this set of unscented white wax Saint Candles. Each burns around 80 hours and features charming vinyl labels with the ladies' faces superimposed onto pious images. Cheers to 1982 - 1993. Some say they were the funniest in TV history. I don't know. I loved Cheers when it was on, both the Diane Chambers and the Rebecca Howe years, but rewatching old episodes now...it just doesn't seem that funny to me anymore. Sorry, Sammy. If you disagree, or know someone who never stopped wanting to go where everyone knows your name, grab the series' 45-disc DVD set and one of these Cheers-themed fleece throw blankets, and settle on in next to Norm and Cliff for the perfect way to get through the rest of the winter. Happy Days had a healthy 11-season run that didn't start, but wrapped up in the 80s. And over that decade we witnessed the debut, the rise to fame, and the solidification of an icon in Arthur Fonzarelli. Fonzie. The Fonz. Sit on it. This faux leather jacket from HollywoodMemorabilia.com isn't just modeled after the one Henry Winkler wore to play the Fonzie character, it's signed by Winkler too. Both in his real and his Happy Days names. I pity da foo' who can't grow and shave Mr. T.'s signature style himself. Bosco "Bad Attitude" Baracus and the rest of the A-Team spent just 98 episodes from 1983 to 1986 carving out a place for themselves in pop culture history. And while the series is technically classified as an action-adventure show rather than a sitcom, I think this horrible "costume piece" from Rubie's is funny enough to earn it a spot on the list. Denise is still a safe Huxtable to talk about, right? From Dwayne Wayne to Whitley Gilbert, even though A Different World was technically a Cosby Show spinoff, it truly became a different world after just a few episodes. Hillman College was the fictional alma mater of Denise's parents and Grandpa Huxtable, and here Etsy shop Fun Creations World recreates its nostalgic splendor with crewneck sweatshirts in your choice of color, and sizes S to 4XL. Alien Life Form at your service for cuddles. I remember watching ALF with my grandma and all she wanted to talk about was the show's "big secret." Who was playing ALF?! Was it a kid? Was it a little person? Was it a real-life resident of Melmac? I don't know if the show actively tried to hide how they brought ALF to life then, but they sure don't now. Wikipedia's got all the dirt organized into list and link fashion. One of the series' co-creators, Paul Fusco, is a professional puppeteer, and served as ALF's "hands" and voice, along with some assistants. ... One of whom, fine, Grandma, was a little person. Hungarian actor and circus performer Michu Meszaro worked on the show, and wore the ALF costume when necessary. He stood 2'9" tall, or a little under twice the size of this vintage 18" stuffed ALF. Seven seasons with the Seavers and all I got was this stupid 4-pack of Topps Growing Pains trading cards. They're not even worth as much as my cousin's Barbie dolls whose hair she cut off. Poor Kirk Cameron. All that work put in to becoming a teenage heartthrob, and 30 years later it's Leonardo DiCaprio who's one of the most famous actors of our generation, while his legacy can't even hold on to a slot in syndication. My first thought was to suggest a framed photo of Richard Nixon as the best gift for a Family Ties fan, but then I found this more inclusive board game. Don't get me wrong, I'm sure it's still mostly about Alex P. Keaton like the rest of the show, but at least Steven and Elyse, and Mallory, the Yothers girl, and baby Brian Bonsall who came out of little brother nowhere! get cameos on the board and in the game's card decks too. Balki Bartokomous arrives at his cousin Larry's Chicago apartment fresh off the boat from...do you remember where? The island of...Pavlos? Provos? Mylos? No! Don't be ridikuuulous! It was Mmmmmm-Mypos! Yes, the fictional Mediterranean island of Mypos! Excellent! Let's do the Dance of Joy! Die-die-die-die, die-die-die-die. Hey! Hey! Hey! Hey! Hey! Etsy shop Peanut Oak Print creates the nod to Balki's trademark "Don't be ridiculous" line in print sizes ranging from 5" x 7" to 50 cm x 70 cm. Even without being a rock star Uncle Jesse was so dreamy! And given that John Stamos looks exactly the same now as he did when his Jesse Katsopolis character debuted on Full House in 1987...Uncle Jesse is still so dreamy! The Rippers, if your memory is a little fuzzy, was a "rock" band Jesse formed on the show. They mostly covered Beach Boys and Elvis Presley songs. Here, Etsy shop UnTeeFeated recreates Jesse and The Rippers Forever Tour of '89 in your choice of color and size S to 5XL. NicoCartoons says their Three's Company 11" x 17" art print is a tribute not just to the show, but to the genius who was John Ritter. Damn. I still can't believe Jack Tripper is gone. Or Patrick Swayze for that matter. Smile and say "Papadapolis!" Starring Emmanuel Lewis as the adorable, dumbwaiter-riding-and-hiding Webster Long, this sitcom packed with social commentary ran from 1983 to 1989. The premise: George and Katherine Papadapolis - George a football player in his first year of retirement, and Katherine his socialite wife - find 7-year-old Webster at their front door after the boy's parents have died in an accident. Webster's dad was one of George's former teammates and friend, and named George and Katherine godparents to their son. The Papadapolises take Webster in and begin raising him over the next 6 seasons of the show. A key feature in the Papadapolis house is their dumbwaiter, which Webster often makes good use of. And they still exist, not only in old, 80s-sitcom-era houses, but as retrofit residential installations, such as those from Elevation Innovation! Their Econo-Lift systems are floor or wall mounted, with a remote controller.